Wind energy is the energy that is created by the wind, which is harvested by the wind mills to produce electricity. As the population goes high the resources, the earth saved for us are depleting day by day. Those situations are compelling us to look into such resources are available to us round the clock. For your convenience and continuity, we shall go in step by step for a better walk way. Let us see what wind is initially. Wind is said to be the air in motion. Due to different factors such as mountains, surfaces, water bodies, desert, clouds and the like the earth’s surface gets heated unevenly. The high temperature areas tend to raise creating low atmospheric pressure where as low temperature areas inclines to sink creating high atmospheric pressure. The air will always move from the high pressure areas to low pressure areas which is called wind. The greater the pressure difference the stronger the wind is. Wind energy is the energy that is produced by the wind flows which is then converted to produce electricity. It is a renewable energy that is plentiful around us and non-depleting as well. Its abundance in the nature makes it ranks as one of the best resource for electricity. The wind energy is captured with the wind turbines that help the wind energy to convert it to mechanical and electrical energy. The main aim behind bringing up wind farms is that wind energy becomes the major producer of electricity. Thus, more and more developments are happening around the World to present it with the most modern techniques. What are wind turbines and how it works? Wind turbine is the device which is used to generate electricity from the power of wind. It looks like an airplane propeller or like a fan that rotates according to the wind. The turbine blades spin as the wind blows and thereby making the shaft connected to the gearbox also spin. This energy is then sent to the generator to produce electricity. The length of the blades have a major role is creating more electrical energy. Depending on the technology and wind speed rate, the blades of the turbine rotates up to 20 times per minute. The life of a turbine is normally calculated on an average of 20 years. Horizontal Axis Wind Turbine, usually known as HAWT, will have the shaft pointed to the direction of wind. In other terms, the axis on which the blades are rotating will be parallel to the ground. It is the most common and efficient wind turbine which is in use, when compared to VAWT. Onshore wind farms are generally located in hilly, mountain areas. Speaking very accurately it can be around the 3 kilometers or more from the nearest coastline. The positioning of the wind turbines really matters as a small difference can last in loss of a real output. Wind tend to get accelerated over a crest and in order to fruitage this, an onshore wind farms are created. 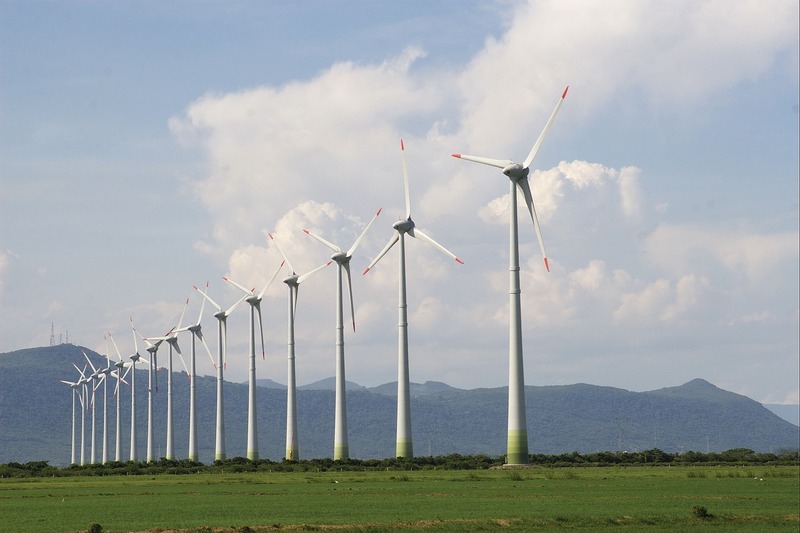 The major onshore wind farms are of United States and China. Offshore wind farms are more prominent than the onshore wind farms as the wind speed is substantially greater in open water. Thus the utilization rates are much higher. United states do not have a single offshore wind farm. Europe is the spearhead in it. The installation, service and maintenance are posing the challenge on the off shore wind turbines. The main advantage is the renewable nature of wind energy. All energy can get exhaustive one day or another whereas wind is never going to end. The production of electricity, using wind energy does not have any side effects on the atmosphere. It does not emit any kind of gaseous substances nor has any kind of air pollution. The main drawback or disadvantage of wind energy is that it is not a budget friendly idea of creating electricity due the price of the turbines, its transportation and installation etc. Also turbines requires a lot of land for installing it. Another negative is that it is really inconsistent. It does not give us any assurance on the energy that is going to be produced. Wind energy is not predictable. Thus it is always a add-on to the electricity generation. A complete dependency is not so clever. United States is one of the major countries, which use wind energy for electricity production. Its abundance in many parts of United States has made it a point that they use this resource on a very large scale.